It's November giveaway time! This month I am so excited to offer you all a chance to win this amazing handbag by Gunas. Who isn't in need of a new bag to rock during the holidays coming up? I know that I am already planning party outfits, and this red bag will most definitely be tagging along for the adventures. I am pretty much obsessed with the bold shade of red and the fact that it adds a pop of color to any outfit. Plus all of Gunas' designs are vegan-friendly which is pretty rad. 1.) 'Like' Gunas on Facebook. 2.) Follow me on BlogLovin'. 3.) Leave all your contact info in the comments below! Good luck to all! Giveaway ends November 21st, 11:00pm EST. I follow you on both GFC and bloglovin. And have been for a while. I also like gunas on fb now. I really really like this bag and especially the color! Love this bag! Following you on Bloglovin and just liked Gunas on Fb! This bag is incredible and your outfits are always amazing. I liked the Guna fb pg and I follow you on bloglovin. oh Bonnie your style is soooo cool! Last night i dreamt i'd met you :D so cool! would be soo happy if you would have a look on my blog! Your rings and bag are gorgeous!! already following you via bloglovin! Following you on Bloglovin and liked Gunas on FB. I follow you on bloglovin ; zuzia03z@op.pl and i like fanpage. i love your style by the way , kisses from Poland! Gorgeous bag!!!! I "liked" Gunas on FB and I am now following you on Bloglovin. It is seriously gorgeous bag. I already have my outfit planned and this bag works PERFECTLY. Dying on the inside over how gorgeous this is. I like Gunas on Facebook and already follow Flashes of Style on BlogLovin'! I did everything! And the bag looks fabulous. 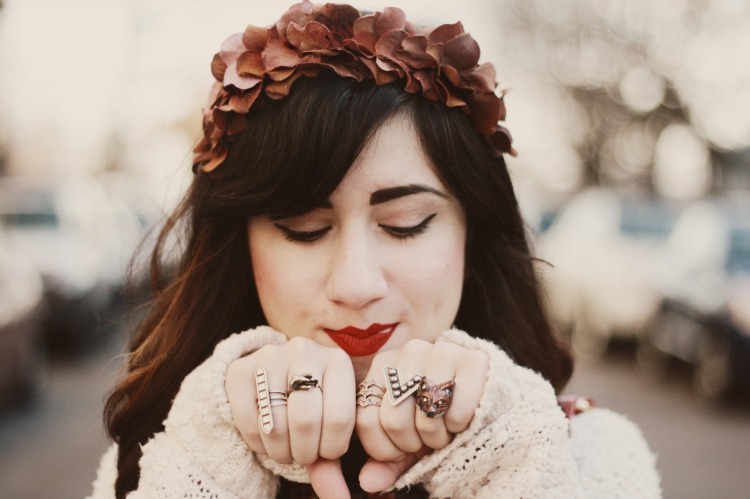 I love, love your fox-ring! Where is it from? I follow you on Bloglovin (deebelievesinyou [at] gmail [dot] com) and "like" the GUNAS Facebook page (D'Aundra Wallace). your rings! beautiful. great give away. love your denim and sweet! I follow you on blog lovin and I like gunas on facebook. Following Gunas on FB and you on bloglovin of course! Just to clarify -- on bloglovin my account is under seamsprettyblog@gmail but please reach me at calia25.cm@gmail. Thanks!! this bag is beautiful ! yeaah I adore it *_*! I like Gunas on Facebook and I'm a bigtime follower of your blog :) This giveaway is aweeesome! You look so cute as always ! Wow that bag is beautiful, I would love to have that in my wardrobe! I already follow you on bloglovin and I just liked Gunas on facebook! love this bag, love/like gunas on FB (and in "real life"), and love your blog. following on bloglovin' since forever. Like on FB: Check. Follow you on Bloglovin: Check. Love the bag - classic with a modern twist! The color is great too; bold and fun! Lovely bag! And I love the white sweater! Absolutely love this bag!! I've liked Gunas and already follow you. Thanks for an amazing giveaway! Liked them on Facebook & follow you on bloglovin. Yay thanks for the giveaway. Thanks for the giveaway! Love the red. It's so vibrant and perfect for the holiday season that is fast approaching. yaaaay! that bag is gorgeous. 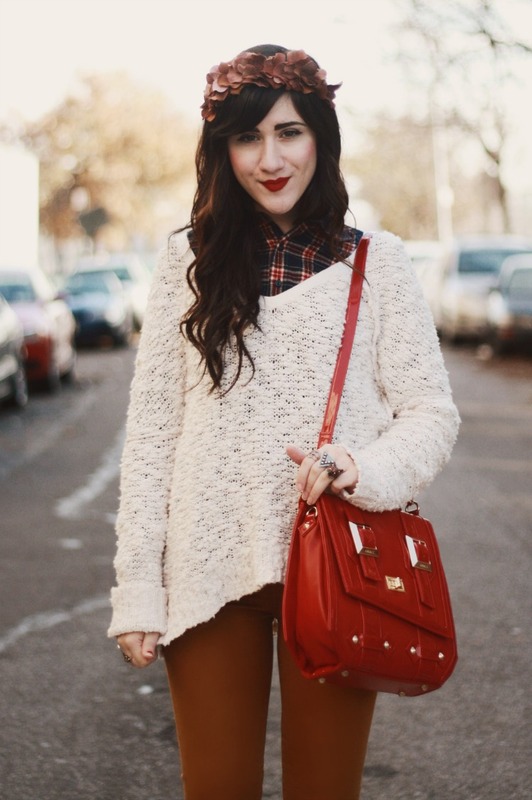 Love the way you combinated the sweater with the diamond blouse! You are so adorbs! I love your DIY headband first of all. And secondly that bag is spectacular, great for all adventures to come! hello! first, thanks loads for this amazing opportunity to win this lovely bag. the red is stunning! i've just followed the facebook page and i'm already following you on bloglovin! Such a gorgeous, bold bad. Need. already following both Gunas and you. Beautiful Look, Loving everything about it. 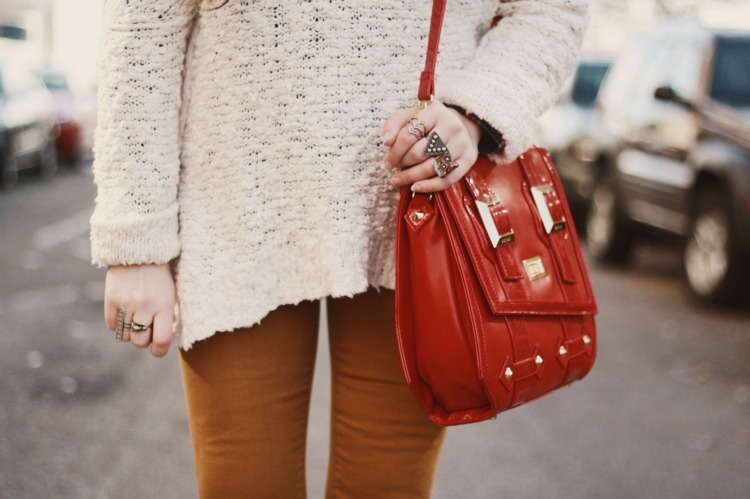 Red purses are my absolute favorite! I liked them on facebook and already follow you on bloglovin'. Liked gunas and already follow you! Red leather is amazing. Red is by far my favorite pop of color too! Great holiday giveaway! Already liked and following with Bloglovin. Love this bag! I want it so bad!! Love your denim color, so cute. I definitely know that I need basically an entire separate wardrobe just for holiday parties! Your red bag is going to be such a cute statement piece! 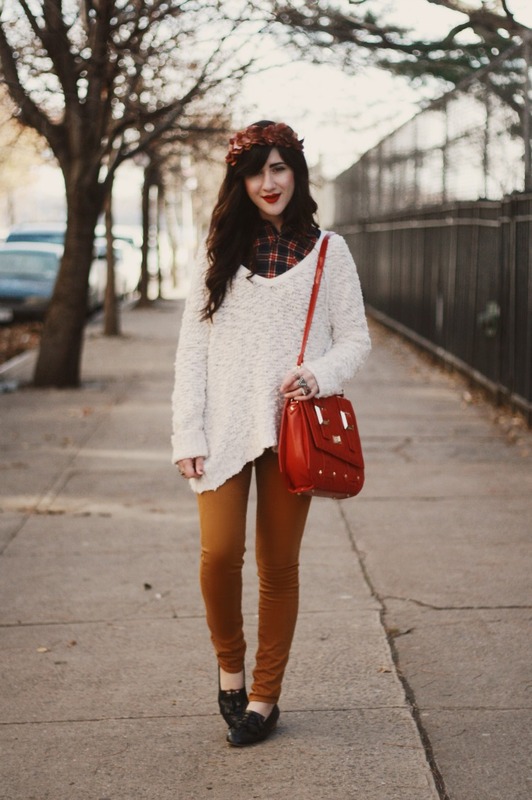 Love that flower crown on you Bonnie, especially with those spice-colored skinnies. Liked Gunas on FB and following you on Bloglovin! Liked on Facebook & following you on Bloglovin! Liked on Facebook & following you on Bloglovin'! Thanks for an awesome giveaway! Such a brilliant bag! I've followed you and liked Gunas on Facebook. P.S the 21st is actually my birthday! The fact that it's vegan friendly is so apealing! Sweet! I like the bag! What a clutch bag. Great giveaway - here's hoping. Awesome giveaway! Lovely styling! Well done Bonnie! I am thinking of entering! love sweater & color jeans! fine flower! What an incredible giveaway! I always love your blogs! such a pretty bag!!! Your posts are my obsession. Believe me I have been following you on bloglovin for quite i while!!! Such a chic bag, I love the colour and the statement buckles! It would pair beautifully with some pieces in my wardrobe. Keeping my fingers crossed..! I liked th pag with the name Anaivilo Borsa and I am following you since forever. of red will certainly brighten my dreary London days! Liked their page and following you! That bag is gorgeous. Hopefully I have some good luck after the terrible week I've been having. I love your outfit and that bag is gorgeous! Hey! I liked them on facebook, and I already follow you on Bloglovin. Thanks! liked on FB + follow you on bloglovin! beautiful. i have a sweater like that so this gives me inspiration on how to wear it! I love your blog!I am following you on bloglovin and I am liking Gunas fb page. :) Wow that red purse is sooo beautiful! I liked on fb and follow via bloglovin! wow, amazing! love your red lips!! i liked on facebook and i follow you on bloglovin'! I've liked Gunas on Facebook as Savannah Belsher-MacLean and followed you on BlogLovin' (savannahbelsher @ hotmail . com). 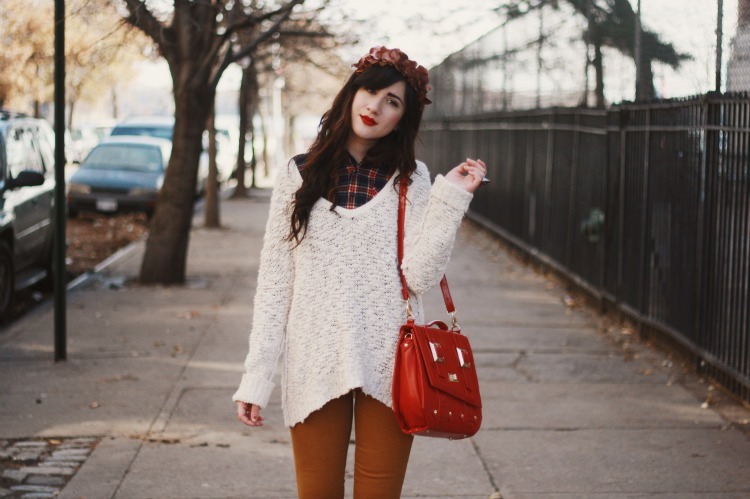 Love the sweater over the plaid! You look awesome! i offer all kinds of loan. Shop For Authentic Gucci Handbags Online.